We love weekends at the Knight house-- weekends mean that Daddy's home and that we spend lots of time out of doors (even more than during the week!). For me, weekends also mean a break from the cooking because Hubster usually grills burgers or makes Sweet and Sour Chicken. Yum! Today, the boys and I kicked off the weekend with a field trip to Carrollton, GA, home of the Southeastern Quilt and Textiles Museum. It's been awhile since we've gone to a museum, so I was good and ready for an adventure. We left right after breakfast because, while Carrollton is also an outer suburb-ish of Atlanta, it is on the exact opposite side of the city from me. Add to that the recent road issues we've had (oh, you know, one of our three major highways collapsing from a fire...), and I knew we had a hike ahead. The circuitous route we took to get there in the midst of morning rush hour ended up being a gorgeous drive through near-rural mid Georgia. I didn't realize that I needed a good dose of open fields, but it did my heart good. Our first stop in Carrollton was lunch at Chickfila, then we looked up a local park for the boys to get some sun and stretch their legs. First, I love their logo. Second, I want a rod installed on this wall so I can hang quilts and take pictures of them! Then, the museum. I never know what to expect when I visit a new museum-- I guess that's kind of the best part. The Southeastern Quilt and Textile Museum is small, friendly, and completely wonderful. Their mission statement suits them perfectly: "As our name proclaims, the SQTM wants to recognize and celebrate our regional and local heritage and influences. Throughout the Southeast many communities developed with a similar story of textile production. We want to share that heritage by highlighting our own history." I neglected to record the exact date of this 1800s quilt, but look at the dye on the backing-- the quilter wanted to add color to the feed sacks, but the dye didn't take evenly. The result? A fabulous showing of the quilting! Today, we saw the "American Feedsacks" exhibit. The quilts on display ranged from highly utilitarian quilts made from large strips of sack sewn together to dazzling stars to an exquisite double wedding ring to a few vibrant numbers from the 70s that can only be described as "visually arresting." One of the sweet staff members, Dianne, walked through the three rooms of quilts with us and pointed out details I might have otherwise missed. As y'all know, I'm pretty new to quilting, so my knowledge of traditional quilts is limited. I was thankful for her expertise and excellent company. The Museum is open Thursday-Saturday from 10am to 4pm, and admission is $5. In addition to being affordable, I was thrilled to find out that the SQTM changes its exhibit quarterly, so I can go several times each year and see all new (and perhaps quite different) pieces. 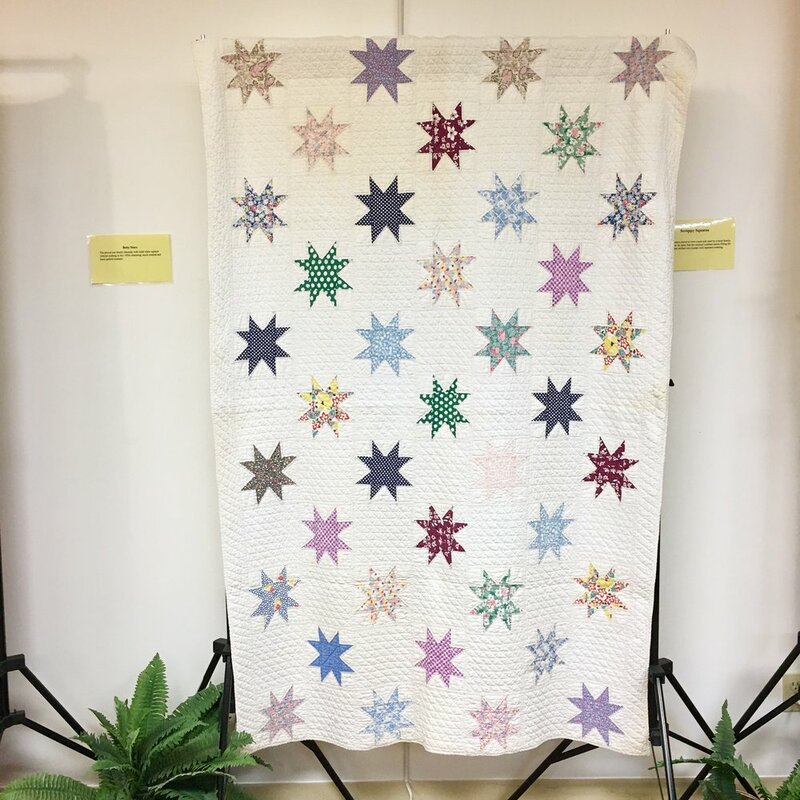 Their exhibits range from very traditional quilts (like today's exhibit), to art quilts, fiber art pieces, and even garments. We will definitely be going again! You can check out SQTM on Facebook to stay abreast of upcoming events and exhibits. If you pass through the area, be sure to stop for a visit! Finally, don't forget to follow along with all of my shenanigans @stringandstory on Facebook and Instagram. I love to hear from you, so please leave comments here or on social media. Also, I am launching my newsletter tomorrow! It will include an overview of the week's blog posts as well as some extra and inspiring content. Click HERE to sign up!